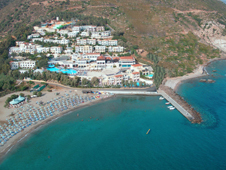 Hersonissos is widely regarded as the tourist capital of the island of Crete. This city is very noisy, cheerful and dynamic resort on the island. It is worth noting that the holiday with children in Hersonissos – not the best option, but the unbridled joy for a big company provided. Numerous clubs, discotheques, luxury restaurants, shops with souvenirs and boutiques – this is what awaits the tourists and travelers. Thanks to a whole network of Irish and Dutch bars located along the coast in Hersonissos is resting a lot of people from England, Germany, Ireland and Holland. Taking advantage of car rental in Hersonissos, you will be able to reserve a vehicle online bookingcar.ru for free movement around the city. Features parking in Hersonissos not differ from other Greek cities. Here there is a public (free) parking spaces, and private parking for parking which you must pay. The closer to the center of the city, the higher the cost of parking, and the smaller amount of free space on them. Also the cost increases as a function of time, during which the machine remains stationary. As a resort and tourist area, the town allows motorists to leave vehicles in the parking lot owned by the hotel, hotels, pensions, etc. (of course, this service is only available for guests). It is strictly forbidden the installation of radar detectors in the machine. In the city, you can fill the car with several types of gasoline, diesel fuel or gas (in the latter case, the gas filling are a rarity). It should also be noted that throughout Greece there is no leaded petrol. In sum, you want to bring in payment for the road affects the distance traveled. Each section of the highway runs certain companies. Payment to be paid directly in front of the entrance to the track. Also, the size depends on the type of transport - renting a passenger car in Hersonissos, you can count on the lowest paid in the region of 1-3 euros.